I enjoy running to find my personal limitations and then push through them. The finish line at the end of the marathon during my first Ironman. I am new to group pacing but have served as a guide for visually impaired runners numerous times. I enjoy helping others achieve their goal. 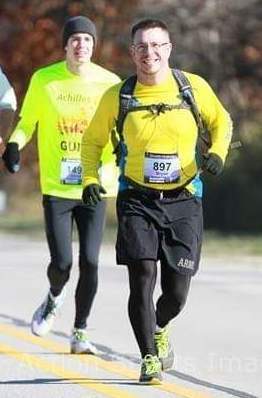 While not technically a “pacing experience” …My very first marathon, I was working with a visually impaired runner from a local running club. Only weeks prior to the Chicago Marathon in 2011 he was seeking out a guide to help. Having never ran a full marathon and not knowing what I was getting into I eagerly volunteered. We ended up running a 4:50 marathon which was at that point a new P.R. for him as well as helping him qualify for the Boston Marathon for his first time. Believe in yourself and believe in your training. Stay present and you can achieve more than you imagine. I enjoy working with visually impaired athletes and other disabled athletes. I have volunteered with multiple organizations which afford these athletes the opportunities to run and participate in triathlon.